Medical professionals have long recommended compression for patients looking to improve blood circulation and overall leg health. Backed by medi’s 60+ years of experience, CEP uses the science behind medical compression to help athletes maximize performance and recovery. ARTERIES - For the athlete, improving arterial blood flow is the key to peaking performance. 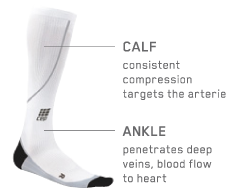 CEP compression socks apply consistent compression to the calf, allowing the arterial walls to relax and the flow of oxygen-rich blood to increase by up to 40%. More oxygen means more power during performance and a faster recovery. VEINS - Graduated medical grade compression that is tighter at the ankle improves vein health by reducing the veins’ diameter and pushing de-oxygenated blood back to the heart. CEP SCIENCE - CEP compression socks have been scientifically proven to improve blood flow, allowing athletes to reach higher speeds using less energy. TEMPERATURE REGULATION - Cooling effect when damp! CEP’s use of performance yarns quickly transports moisture away from the skin. By moving moisture to the outside of the garment evaporation is increased, reducing the temperature by as much as 7 degrees Fahrenheit. A Faster Run: The latest studies show that athletes wearing CEP compression socks can improve their running time by 5%! At a marathon time of four hours, this would equal twelve minutes gained. ﻿An Easier Run: With CEP, athletes decrease exertion by approximately 6% while actually reducing muscle strain. Quicker Recovery: Even when an athlete is at rest, CEP compression socks increase blood circulation by up to 30%** shortening recovery time. Shin Splints: Reduces vibration, increase oxygen and promotes healing. Calf Cramps: Increase oxygen to optimize muscles, removes lactic acid. Achille Issues: Increases oxygen to the Achilles; padding prevents damage. Pulled Muscles: Increases blood flow to increase warmth in the muscle. Traveling Issues: Graduated compression prevents venous reflux and pooling.